You can tell March is here. Bright and sunny today but it was -19c when I was putting the recycling to the curb this morning. Managed to ignore the lovely sun by spending the morning in the basement sorting slides and organizing my talk for Canada Blooms tomorrow. In the winter, talking about gardening is almost as much fun as actually doing it and a bit easier on the back. The last of the Christmas Amaryllis are putting on a magnificent show and some of their older cousins, resting in the basement, are starting to show signs of life despite a complete lack of water, light or warmth. They are amazing plants. The Orchids in the solarium continue to open but they gave me a nasty surprise this morning. 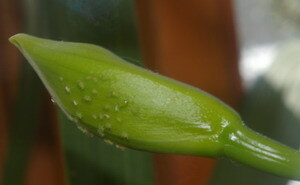 Many of the unopened blooms were covered in ugly, little, green aphids. Now I have grown these same orchids here for several years and this is the first time I have seen these aphids. The Hibiscus tree over top of them is usually building up quite a colony of whitefly by this point in the winter but they are much less numerous this year and the Hibiscus also has some of the Aphids. My cure for the whitefly in late winter is simply to give the tree its annual heavy pruning; getting rid of most of the leaves and thus eliminating the whitefly’s home and food source. I obviously don’t want to prune the blooms from the Orchids so my next best trick will be to wash them with a bucket of warm soapy water. It will take a while but they are worth it. 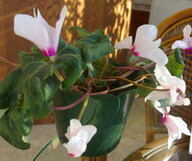 I seemed to have mastered the art of reblooming Cyclamen. These are very showy flowering plants sold in the winter, because they like to grow in a cool place, and greenhouse operators like to keep their fuel bills down. I have one that I purchased several years ago and it goes outside every summer, dies down and is dormant through the fall and then I put it into the solarium in the late fall and it not only starts to grow but flowers quite happily. There was no thought or planning involved it just sort of happened the first year and now it continues the cycle. Another of those amazing things that keeps us gardening. Someday, when I have the time, I’ll do a little research but the danger in actually knowing what I’m doing is that the Cyclamen will find out and stop responding so nicely. www.gardening-enjoyed.com has new sections developing. The first, on annual flowers is well on its way and you can watch for the beginnings of the vegetable gardening section. The wind and the ice last week actually bent the steel flag pole in the front garden. I’ll tell you all of the exciting things that I saw at Canada Blooms in our next issue of Dallying In The Dirt.